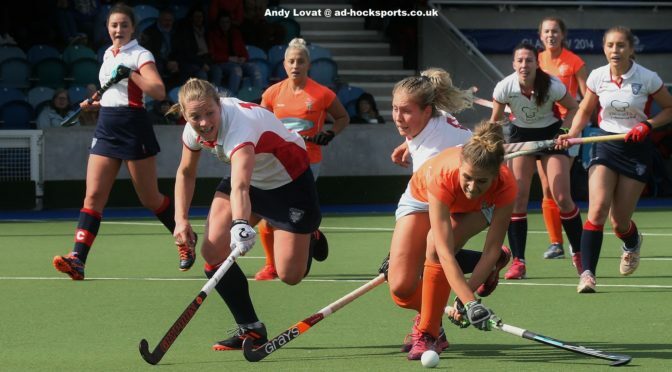 Clydesdale Western 1st XI missed out on a place in Europe next season as their Women’s Grand Play-Off Final hoodoo continued after succumbing to defeat against Western Wildcats at the Glasgow National Hockey Centre on Saturday. ‘Dale Western conceded a goal in each half to lose the Final, which coincidentally was their third straight Play-Off Final loss. Opponents Western Wildcats produced a hardworking and clinical display to become the first team in Scottish Hockey history – including Men’s teams – to have won the Play-Offs despite finishing fourth in the league table. The L1s were without the services of Karin Belch for the Final, but Laura Mann returned to the squad as a like for like replacement. The game itself proved to be even with both sides having plenty of the ball, but were unable to create any clear cut opportunities. And this was proving to continue until a defensive error from Clydesdale Western brought Wildcats’ first goal. An effective press just outside the L1s circle gained the Milngavie side possession, before Wildcats’ Heather Aitken picked up a pass and slid the ball under the onrushing Jessica Buchanan. Heather Lang was not far off from leveling matters with a diving deflection not long after but in truth it was Western Wildcats who looked more likely to score their second before the break with a combination of a hardworking defensive unit and an ambitious attacking display. And the Cats got their second goal seven minutes into the second half when a Kate Holmes slap from a corner was deflected high by Megan Cox into the ‘Dale Western goal. On a few occasions after the goal number two, the L1s threatened through Emma McGregor and Millie Brown but found Western Wildcats difficult to break down. As the game went on, Wildcats were closer to a third goal but a series of defensive tackles and crucial saves from Buchanan kept ‘Dale Western in the contest. Wildcats went on to see the game out, however, and seal a famous victory, which means Clydesdale Western will miss out on Europe for next season. The L1s will now turn their attention to Lille, where they will be playing in this season’s EuroHockey Club Challenge I – starting on April 19. Elsewhere, the L4s secured a third place finish in Women’s West District Division One in their final league game of the season. Goals from Ellen Murray (two), Wendy Justice, Marnie Moulson, Karen Longmuir and Abbie Allan helped the L4ss to a 6-3 win on Sunday away to Dumfries 1s to lift them three places up in the league table. The M3s, who also featured on Sunday, went down 5-2 at home to Uddingston 2s in Men’s West District Division 1A, despite a goal each from Ali Bleach and Conor Oliver. The M4s narrowly lost 3-2 in their Men’s West District Division Two clash with Hillhead 5s – Johnny Bradley and Foster Harrowell were on target for the M4s.